A novelty at Munich 2011. 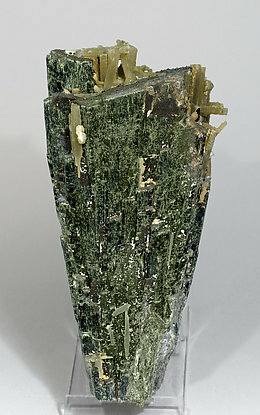 Elongated crystal of Hedenbergite with parallel growths, of slightly fibrous aspect, grayish green color and silky luster. It is crowned by a group of Quartz crystals. Parallel growth of Hedenbergite crystals with perfect terminations. The prismatic faces have a slightly fibrous aspect, grayish-green color and silky luster. They are partially coated on their base by lenticular crystals of Calcite and crystals of Quartz. 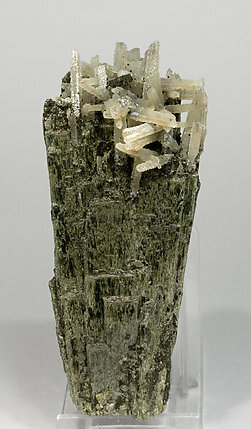 Parallel growth of Hedenbergite crystals with perfect termination. The prismatic faces have a slightly fibrous aspect, grayish-green color and silky luster. They are partially coated on their base by crystals of Quartz and small crystals of Calcite.